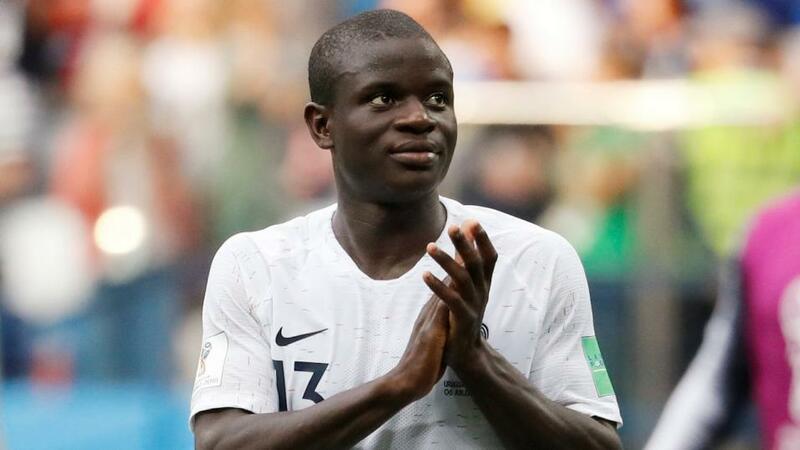 Will N'Golo Kanté and France win the World Cup? "Didier Deschamps' charges are favourites, which seems about right given the convincing nature of recent performances. France have trailed for just nine minutes and 12 seconds all tournament"
Pre-tournament favourites for a decent chunk of punters, France are now just one step away from sealing their second World Cup title. And while one could still argue that Les Bleus have some spare capacity, especially as far as attacking fireworks go, their progress to Sunday's showpiece has been undeniably impressive. The madcap 4-3 win over Argentina is the game that will probably live longest in the memory, but the two victories since - 2-0 against Uruguay and 1-0 vs Belgium - have been feats of remarkable control. France held their opponents at arm's length throughout both matches, ensuring they got full value for their own incisive forays forward. With N'Golo Kanté protecting a durable, streetwise defence, they will take some breaking down in Moscow. Kylian Mbappé has taken most of the plaudits at the other end of the pitch, and understandably so. But Antoine Griezmann has also gone about his business with quiet efficiency, aided by Olivier Giroud, whose Stéphane Guivarc'h impression is really coming on. Throw the in-form Paul Pogba into the mix and you have a mightily impressive starting XI. That distant drum beat you can hear is the collective heart rate of the Croatia squad, just now returning to normal after SIX HOURS of knockout football in the last couple of weeks. It's been a long, fraught road for Zlatko Dalić's men, who have shown remarkable resilience - and no little craft - to get this far. Croatia's strong suit is obvious: the midfield is capable of running matches from start to finish, with authority and panache. Luka Modrić's artful displays have put him in the running for the Golden Ball, while Ivan Rakitić and Marcelo Brozović construct moves from deep, plotting and nudging. England's players were unable to keep up on Wednesday night, and France will need to do much better. The question for Dalić is whether his charges have anything left in the tank. Šime Vrsaljko, Mario Mandžukić and Danijel Subašić all dragged themselves through the semi-final despite injury worries, and more of the same is expected here. You might expect the extra exertion - plus the fact France have had one more day of rest - to catch up with them at some point, but this team's willingness to go above and beyond is not in doubt. Didier Deschamps' charges are rated [1.96] favourites to win inside 90 minutes, which seems about right given the convincing nature of recent performances and their opponents' growing fatigue. France have trailed for just nine minutes and 12 seconds all tournament, which underlines their level of control, and while Croatia have come from behind in all three of their knockout matches, the feeling is that they would struggle to perform a similar feat against Les Bleus, who defend with such grit and pose a threat on the break. We can squeeze a little extra value from a France victory by looking at the goals markets. Six of the last seven World Cup finals have gone under the 2.5-goal mark (the exception being Les Bleus' 1998 win over Brazil), and if the Uruguay and Belgium games are anything to go by, Deschamps' side are more likely do record a businesslike win than cut loose. France/under 2.5 goals is available at [3.35]. France's No.7 has operated below the radar all summer, but has three goals and two assists to his name so far. Griezmann is also very much a big-game player, having scored or assisted 11 goals in nine knockout games at major tournaments in his career. With penalties and free-kicks in his locker, [3.4] is a good price, even against a stubborn defence. France and Croatia have faced five times previously, with France winning three of those games (in 1998, 1999 and 2000) and the other two games ending as draws (2004 and 2011). The French are [1.36] in the Draw No Bet market. Two of France and Croatia’s five meetings have been at major tournaments. France won 2-1 against Croatia in the semi-final of the 1998 World Cup – with Didier Deschamps playing the full match – while their meeting at Euro 2004 ended in a 2-2 draw in the group stage. Both teams to score is [2.46]. The last three World Cup finals have all gone to extra-time. However, historically, only two of the showpiece games have ever been decided on penalties (1994, 2006). The full-time draw is [3.35]. France have reached their third World Cup final, winning one (1998) and losing the other on penalties (2006). Their three appearances in finals since 1998 is also more than any other team over the last 20 years, ahead of Brazil and Germany (2). France are [1.48] to win their second World Cup. Croatia have reached their first World Cup final, becoming the 13th different nation and 10th European country to do so. The last two first-time finalists have both won the tournament (France in 1998 and Spain in 2010), while the last to lose were the Netherlands in 1974. Croatia are [3.05] to win their debut World Cup. France have trailed for just nine minutes and 12 seconds at the 2018 World Cup, while Croatia have been behind in all three of their knockout matches. France are [3.45] to win half-time/full-time. Excluding shootouts, France have won 11 of their last 14 games in the knockout stages of the World Cup (D2 L1). They are [1.94] to win in 90 minutes. Antoine Griezmann has scored or assisted 11 goals in nine knockout games at major tournaments (World Cup + Euro), more than any other player for France over the last 50 years ahead of Zinedine Zidane (8) and Michel Platini (6). Griezmann is [2.9] to find the net. France’s Kylian Mbappé will be looking to become only the second teenager to score in a World Cup final after Pelé, in 1958. Mbappé (3 goals) is already the highest scoring teenager in a World Cup tournament since Pelé (6 in 1958). Mbappe is [3.5] to score. Only France’s Antoine Griezmann (2 goals, 2 assists) has been directly involved in more goals than Mario Mandzukic (2 goals, 1 assist) in the knockout stages of the 2018 World Cup. Mandzukic is [5.6] to add to his goal tally. Ivan Perisic has been involved in 10 goals at major tournaments for Croatia (6 goals, 4 assists), the joint-most along with Davor Suker (9 goals, 1 assist). Perisic is [6.4] to score again.